As you can see from the video, walls can be positioned directly against a photographic or painted background. Then you’ve got arched brick walls which are also fun to make… adding character to any model railroad scene. Walls like this can provide extra height to your layout, and also form an excellent transition to an upper level. In my opinion, downloadable plans are the way to go! Constructing a long wall like this one using plastic model kits would cost you a small fortune… and that’s not even allowing for the cost of paints and airbrushing to hide the plastic look. What I also like is that brick walls can be a great place to include extra detailing such as advertising posters, and maybe a little graffiti for even more realism. These downloadable designs include a lot of fine detailing. The clever thing is; you download the plans just once … and, you can print out as many duplicates as you might need for your brick wall to stretch the distance you want. Save the designs on your computer and you can make more walls later. Better still, you won’t need to buy model paints or spend hours adding details, airbrushing, and weathering. It’s already done for you. And, you’ll find these designs fun to assemble using whatever materials you want…. card, balsa wood, or even corflute. So, you can make each wall as strong as you want! Arched road and rail bridges are another interesting feature to include on a layout. I’ll show you a couple of examples. 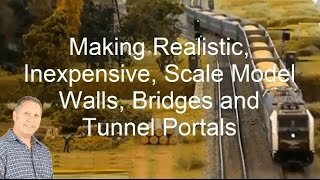 Just like the other plans, these very realistic road and rail bridges can be downloaded and made to HO scale, OO gauge, and N scale. You can even make a concrete fly-over bridge similar to the one in this video. Tunnel portals are also fun to make yourself. You cut out the plans and glue the realistic photo designs onto card or corflute.